Ruh’s Cafe in BTM does al fresco seating for that perfect open-air ambience you can enjoy with your squad. The indoor seating, packed with artsy decor and a bookshelf, is perfect for some alone time. Also, to keep your tummy happy, there’s pizzas, pasta, and munchies, all served fresh and yum here. 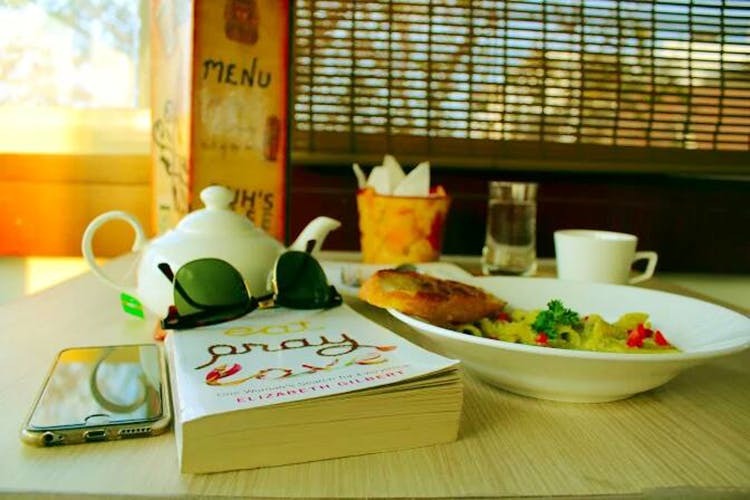 Ruh Cafe’s is a quaint, cosy cafe that you’d loving coming back more for its artsy vibes and decor, and the general feel-good factor of the place. Whether you decide to park yourself by the bar stools for a smoke and enjoy the warm Bangalore breeze or sit inside with your laptop and work, the ambience is perfect for both. The place is also a hub for artists, musicians, and writers to come together and share ideas. Often on both weekday and weekend nights, you have some sort of live music or book launch going on. Truth be told, the place is always buzzing with activities. The menu at Ruh’s Cafe is consists of the usual Italian-Continental-American fare, but it still manages to bring a smile on our faces when we dig into a thin crust pizza or the saucy pasta. Quick and friendly service is what makes the dining part of this cafe a good experience. If you’re chilling here alone might we suggest something such as the light yet filling Let’s Go Crispy Salad, which comes with crispy chicken, lettuce, red chilli flakes, and mayo dressing or the juicy Cheesy American Burger that comes with a cheese burst patty and a chicken patty? Checking in with the squad? Paprika Hummus, BBQ Chicken Pizza, Crispy Honey Chilli Lamb, and Sizzlers are highly recommended. There’s WiFi and the prices are pocket-friendly — winning traits we say. Oh, and yes, finding a parking around the cafe is a bit hard, but you can always Uber it to this place like we did.